1. Pick a sheet within your First Edition Wild at Heart 12x12 paper pad and approximately tear 2cm off from each side to create a vintage effect. Glue this on top of the wooden effect sheet in your Wild at Heart 12x12 paper pad. 2. Cut a 5cm x 20cm strip of blue Wild at Heart paper and adhere it to the top left corner of your layout, vertically, with glue. Cut a 5cm x 15cm strip of brown paper from the Wild at Heart pad and glue it horizontally across the blue strip. 3. Stick a Belle and Boo doily toward the top of your strips ensuring to overlap them to add a collage effect. 4. Use the largest and second largest die within your First Edition Torn Edges die set on coordinating Wild at Heart paper designs. Layer together with glue. 5. Next, use the third largest die within the same set to die cut your chosen photo, glue this to the centre of your layered squares. 6. Cut out two rabbits from your Wild at Heart paper pad and place them around your photo with glue. 7. Next, cut a 2cm x 20cm strip of Wild at Heart paper and glue vertically on your scrapbook on the bottom right hand corner. To add more of a collaged effect, cut a variety of coordinating strips of paper and layer them together both vertically and horizontally. 8. 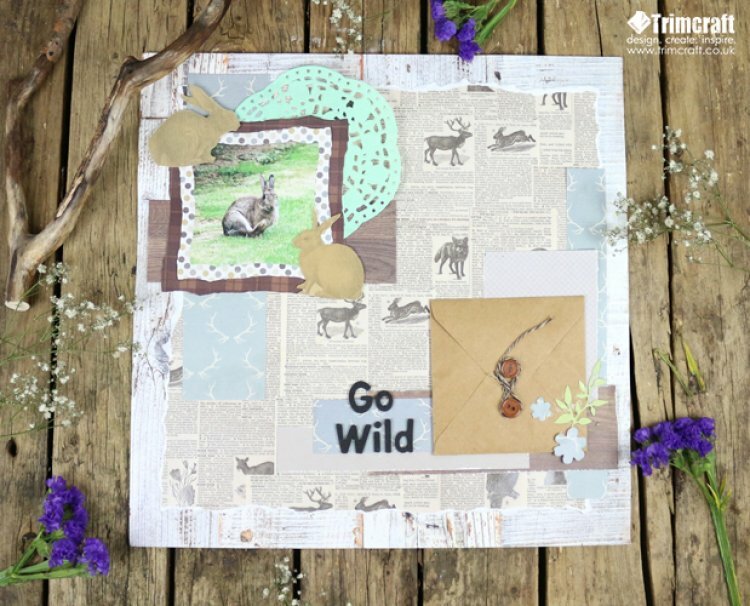 Create a mini album by cutting 8cmx 8cm squares of Wild at Heart paper, punching two holes on the left hand side and threading through a length of Dovecraft Twine to hold it together. Stick a selection of photos and text to accompany it to create a small keepsake! 9. Place it inside a Dovecraft 3 ½’ x 3 ½ ‘Kraft envelope and glue a button to the bottom of the flap and one directly underneath it. Loop a length of Dovecraft Twine to secure your envelope. Glue the envelope with your mini album inside to the bottom right corner of your layout. 10. Use the Simply Creative black foam alphabet stickers to create the words, ‘Go Wild’. Adhere them to the left hand side of your envelope. 11. Die cut a selection of leaves and flowers from the First Edition Nature die set on alternating pieces of Wild at Heart paper and glue these down to your envelope to add interest. The Wild at Heart designs are perfect for capturing your time spent outdoors! How will you use the papers in your scrapbook layout? We would love to see, so remember to upload your makes to the project gallery and to #trimcraft when uploading to social media!